When I lived in Mostar in 1998, I visited a town called Ljubinje every week. Ljubinje is about 2 hours drive from Mostar, and was in the Serb-governed territory, Republika Srpska. Ljubinje was isolated, a small town on the edge of Republika Srpska, right on the edge of the so-called Inter-Entity Border which divided the Republika Srpska from the Muslim-Croat Federation. This complex organisation of the nation-state of Bosnia & Herzegovina is thanks to the Dayton Accord peace plan that brought an end to the 1992-95 wars but enshrined division along ethnic lines across the land, and wrote these divisions into the Constitution. To get to Ljubinje, I would drive out of Mostar (Bosniak territory) and almost immediately enter ‘Croatian’ territory. There were no visible borders or demarcation lines between the Bosnian and Croatian territories, but at that time, people of one group didn’t tend to enter the territory of another group – they would feel unsafe or uncomfortable. Car number plates clearly showed which part of the country you came from, including a symbol or shield insignia that left no doubt which ‘ethnic entity’ the car belonged to. Mostar at that time felt like a ghetto to many of the local people, with only one road out of town that did not pass through other entity territory. Ljubinje and the other towns between it and Mostar are in Eastern Herzegovina, a land of very dramatic landscapes – all looming rocky cliffs, mountains in the distance, and the intense blue waters of the Neretva River carving a rough and jagged path through the landscape. The roads were okay; I can remember one particular point on the journey where three land mines had been placed, equidistant from each other across the middle of the road, and once detonated, had left three neat holes in the road. Driving cleanly between these holes became a weekly goal that took me some time to achieve. We drove through the town of Stolac. 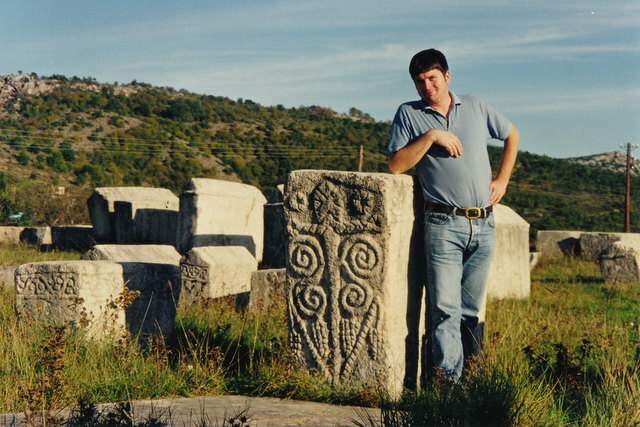 Stolac remains forever etched in my memory from that time for two reasons – the Bogomil tombs and the dynamited houses that we drove past each week. The Bogomil tombs are tombs from ancient people that dwelled in this region centuries ago. They are striking in the landscape – like standing stones in the UK and Ireland. However, these are tombs, and each stone is etched in stylised designs and symbols. We drove past them every week but never stopped (we were always running late for the Ljubinje workshops). 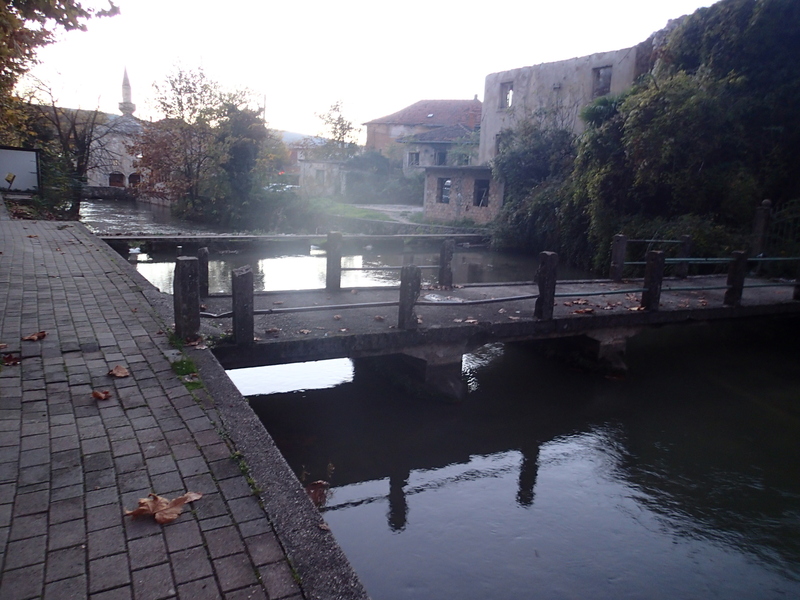 It was only in my last week in Mostar that I made the effort to stop, get out of the car and explore the site in detail. The dynamited houses were a result of the returns process that was underway at that time. People will remember that a characteristic of the Bosnian wars was the violent expulsion of groups of people from their homes. These people would be forced to leave (often very violently, terrorised and brutalised by the militia groups that expelled them) find shelter in another part of the country, a part that was held by their own ethnic group. By 1998, expelled people were gradually being encouraged (by the international forces, and the terms of the Dayton Accord and peace plan) to return to the homes they had left. 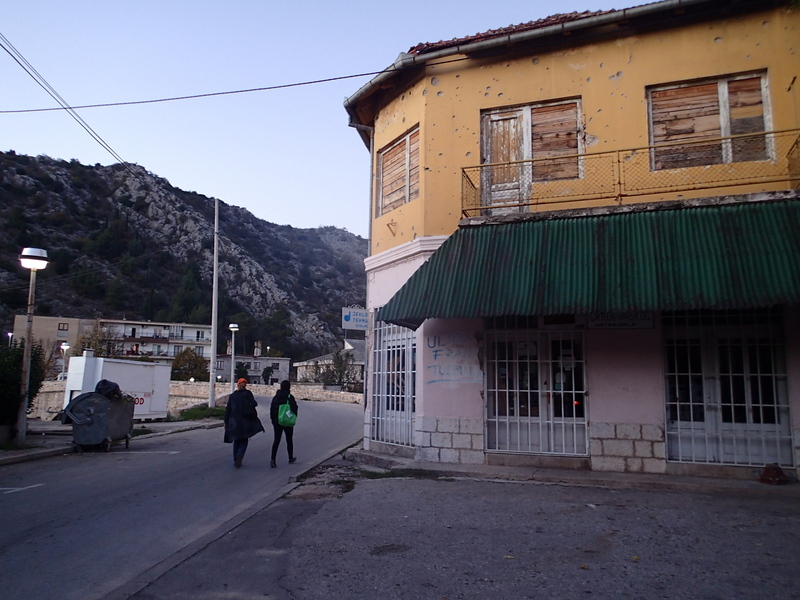 But in Stolac, these homes would be dynamited right before the people were due to return. 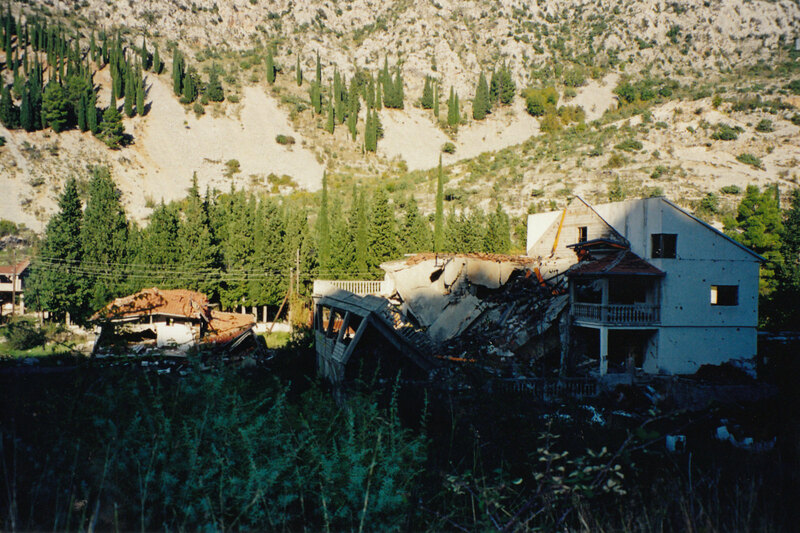 Every week, I would see freshly dynamited houses on the road in and out of Stolac. 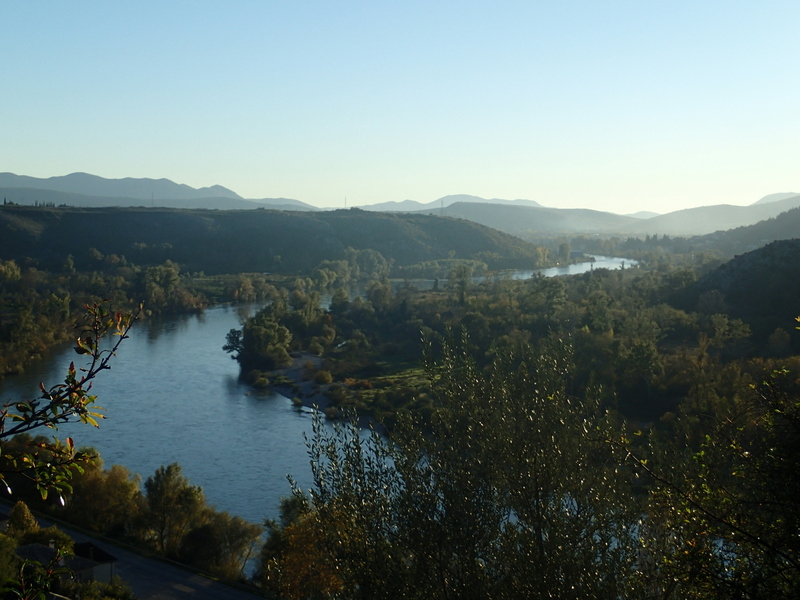 During my fieldwork over the last few weeks in Bosnia-Herzegovina I had the opportunity to return to Stolac, and to reconnect with the teacher I used to work with In Ljubinje. I met him with my translator in the evening in a café in Stolac. We arrived a little early so were able to take a walk through the town, alongside the river. The sun was setting, and the colours were golden. Like many other Herzegovinian towns, Stolac is a valley town, surrounded by steep hills. The river cuts its way through the centre of the town. 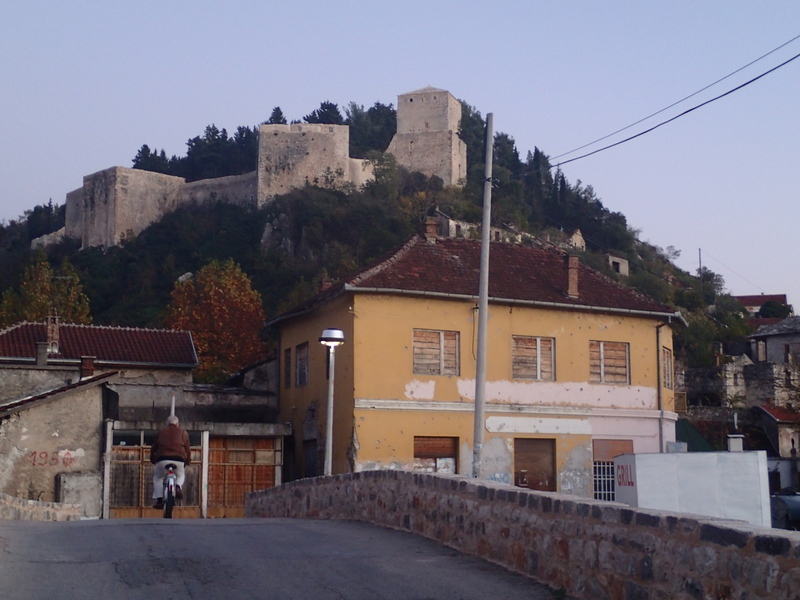 I was surprised by the hilltop fortress in Stolac. “It’s been restored,” they told me. “It was damaged in the war, so it probably wasn’t very noticeable last time you were here. The walk through the town alongside the river has some nice scenery. As in most of this region, you find ruins sitting alongside reconstructed and brand new buildings, and some older buildings still pockmarked with scars from shelling. 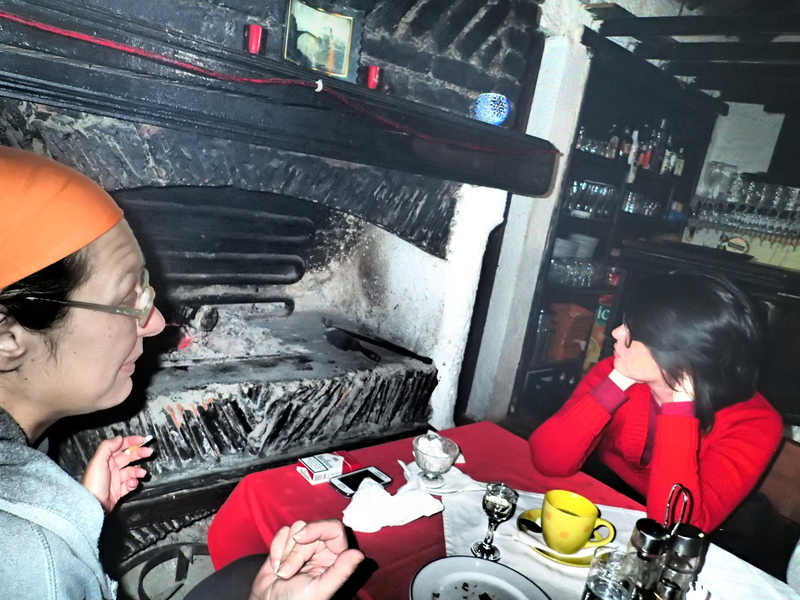 We found a pleasant restaurant where I ate an excellent pljeskavica (local version of hamburger). I also proved delectable prey for a lone mosquito, who bit me up and down my right leg while I sat at the table. The bite marks are only just starting to fade. It was wonderful to reconnect with Sergej, the teacher we worked with in Ljubinje back in 1998. 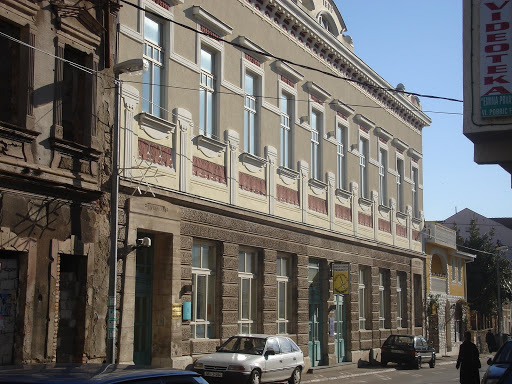 Sergej had established a drama group for local high school students at that time, and supported them to write and perform their own shows. They created over ten different original shows for the Ljubinje community between 1998 and 2013 – a significant contribution in a town that is isolated in every way. In 1998 I remember we couldn’t even telephone to Ljubinje easily – the Republika Srpska used a different phone system to the Federation. 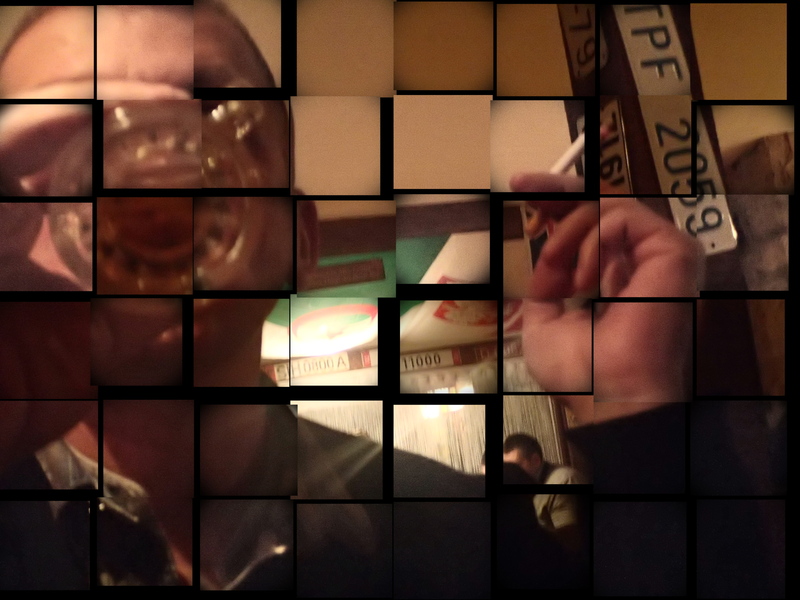 Sergej has had a lot of challenges in his life since that time. But despite these, he is still the same lively and engaged person, still thinking about the young people and their needs, and believing in their importance to the town. It must be difficult to be one of only a few open-minded, culturally-oriented people in a small town. He said the internet has made a big difference in people’s lives there, it has opened people up to the wider world. This region has seen a lot of suffering among the people that live there. I hope that the sense I have of it being a little more open, a little more relaxed, than when I was last here in 1998, is a sign of a shared and welcome progress. How many photos of bridges can I get away with taking (and sharing on Facebook)? The Stari Most (Old Bridge) of Mostar is an incredibly photogenic subject. From every angle, at different times of day… it’s easy to get to the end of the day and find that you’ve taken a ridiculous number of photos of just this one site. A friend of mine – Mostar born and bred by now living in London – says that the bridge is like his muse. He has painted it, created numerous etchings and prints, created stylised versions of its graceful arc, as well as photographed it (along with the intensely aquamarine waters of the Neretva River below) more times than he can probably count. This obsession has endured since his childhood here. Last Saturday was the twenty-year anniversary of the destruction of the Stari Most. 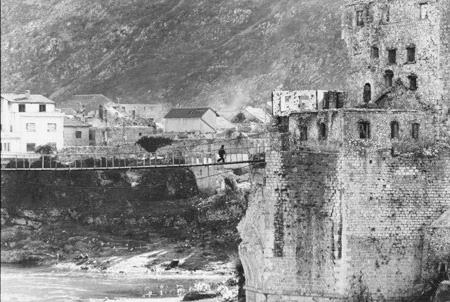 This article gives some interesting historical and contemporary context for what the bridge means for many of the people in Mostar. 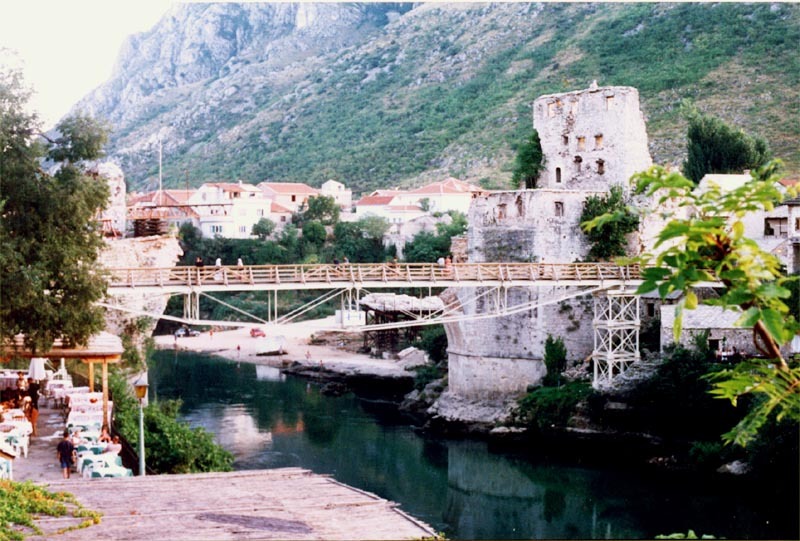 When I lived in Mostar in 1998, there was a temporary suspension bridge spanning the Neretva at the place where the Old Bridge had stood. It sometimes felt like a precarious crossing – it would sway in response to people’s weight and movements as they crossed, and frankly, it never felt all that safe. It was easy to imagine slipping through the wide chain-link barriers, although I never heard of that happening to anyone. People would joke about how the sense of swaying increased if you crossed it when drunk, late at night. At that time in Mostar there were many stray dogs that used to hang around in packs (like street gangs of youths – but they were dogs). A friend told me a story about walking home late one night, a bit drunk, and crossing the bridge only to see the pack of dogs waiting for him at the end of the bridge. It was winter time, and the dogs were known to be hungry and aggressive. My friend made a sharp about-face and sprinted back the way he’d come, the bridge swaying relentlessly. He opted to go the long way home, via a different, more stable bridge. Later that year, a new, sturdier temporary bridge was built. This was in preparation for the reconstruction of the Stari Most, using stones that had been salvaged from the river when it was destroyed in shell fire in 1993, as well as new stones from the quarry that had provided stones for the original Stari Most in Ottoman times. This new wooden bridge was wider, and a couple of metres further upriver, so that the reconstructed bridge could be built in the original place, using the original mounts and towers. But many people said they missed the dodgy, wobbly suspension bridge. Perhaps it represented that time after the war had first ended, when people could come out of their basements and move a little more freely, and the optimism and relief that accompanied that time. The suspension bridge also represented something of the toughness and hardiness of the people. It was a solution, a place to cross the river, a kind of defiance. The reconstructed bridge opened in summer 2004. Local people have described to me how so many of the people that had left Mostar to escape the war returned for that occasion. The bridge is not just a beautiful piece of architecture and engineering, nor is it just a landmark. The bridge represents something about that emotional sense of belonging, and of protection, perhaps. The bridge is Mostar, Mostar is the bridge. Something like that, maybe. In any case, perhaps this is the reason that so many of us seem to experience a kind of insatiable appetite for images of this bridge that we can take away with us, and share with others. Really, everyone smokes here. It’s amazing to me how quickly I have become accustomed to being in smoky environments. They seem normal. Every now and then a wisp of smoke enters my mouth or nostrils in an unexpected way and makes me cough, and every now and then I need to brush the smoke away from me, but in general, I’ve stopped noticing it pretty quickly. I’ve never smoked. As a teenager, I could never really see the point. I’m not sure what that says about me – I think I had my own ways of rebelling and the idea of putting a little bit of foam and paper rolled around brown bits of dried leaves, setting it on fire, putting it into my mouth, and breathing in was simply never appealing. I had friends who smoked; sometimes they looked so relaxed when they lit up and inhaled the first lungful that I felt curious to try, but I never bothered. Whereas here, I don’t know that it is related to coolness or rebellion. It is just something that everyone does. One of my interview participants told me that most people start around the age of twelve. I suppose parents can hardly advise their children not to start smoking, given that every adult around them lights up whenever they wish. Perhaps it is a kind of rite of passage into adulthood. The other day, when I was visiting some band rehearsals at the Mostar Rock School, I noticed how when the break was called, tutors and young musicians alike went out to the bar or atrium area to smoke together. It looked like a nice, social moment that reinforced the lack of hierarchy or status between the teachers and students, a quality that is very evident at the Rock School. Of course, everyone knows it’s not good for their health. But that in itself does not seem a strong motivation to quit for many people here. And let’s face it, it would be really difficult to be a non-smoker in an environment where everyone else smokes, especially if you have been a smoker yourself. It’s much easier for someone like me who has never smoked and holds a rather pragmatic bewilderment about the whole ritual! There do seem to be some non-smoking spaces around – a cevapcici shop I went to was non-smoking inside; and the kindergartens I visited didn’t have adults smoking in the children’s rooms (although lighting up in offices was more likely to be on the cards). Full power to those who do decide to quit! I’d love to think there could be a secret, subversive underground movement of non-smokers here, standing their ground, tolerating the smoke of others but not partaking themselves. I’d love to see some kind of health-food café or even movement here – imagine! a café that doubled as a food co-op, smoke-free, where like-minded people could gather and take strength in their growing numbers. Could it happen? I’d go there! After nearly three weeks of fieldwork interviews in Bosnia-Herzegovina, I think I am suffering from an ailment that could be called ‘fieldwork neck’. It’s a result of sitting to interview people in noisy cafes with unrelenting background music playing. In order to hear the conversation, I lean forward and inevitably, my head goes further forward than my neck and shoulders. And I hunch, dropping down into my shoulders. Then, because the topics under discussion in my interviews are fairly involved, and because I am thinking hard and making connections between what people are describing and what I have learned from earlier interviews, I sit in this position with quite a large amount of tension for extended periods of time. Sometimes, people lower their voices, or lean back in their chairs, and so I lean further forward. One fairly shy woman sat with her head bent forward, but as the interview progressed, lowered her head closer and closer to the table. I of course followed suit, as did my interpreter. Intense conversations lead to intense experiences of fieldwork neck! I first observed fieldwork neck in my interpreter, because I sit next to her in the interviews and can see her. Then I realised that I had been waking up each morning with a kind of tenderness at the base of my neck for the last couple of weeks. I’d put this down to using a different pillow to the one I’m used to, but now I think it is caused by my head position in interviews. Of course, I am also spending a lot of time at my laptop, typing up notes, writing emails, and going through the photographs I’ve been taking. I do most of this kind of work sitting on my bed, late at night. So all in all, this has been tough going for my neck and spine, and given that tough treatment, it is probably holding up quite well, all things considered. Despite the neck issues, this has been an incredibly fruitful trip. Today is my last day in Mostar. The majority of my interviews have been here, because the music centre that I am focusing on as a case study for my PhD is in this town. Tomorrow morning I’ll catch the train to Sarajevo, and meet with a few more people before flying back to Australia (via Istanbul and Singapore) on Friday night.